With coffee, food, events and community, life happens at Urban Timber Coffee, Microbrew & Wine. Through our products and people, we represent the very best of our sophisticated urban cities and the organic vitality of the pacific northwest timberlands. We love our company and hope you will too. 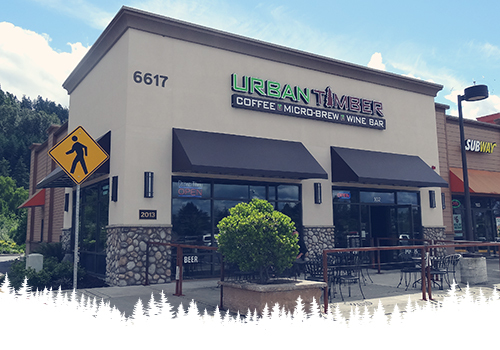 We invite you to come by and enjoy the Urban Timber experience. Our coffee is roasted locally by Dillanos, in Sumner, just down the street from our flagship store. We use a special dark roast for our espresso. With a list of custom creations to make your beverage your own, you can partake in something different every time. If espresso is not up your alley, we also have a variety of other caffeinated and bottled beverages to try. Our Sumner and Kent locations offer a nice selection of wine and micro brews (on tap, twelve micro brews at Sumner and six at Kent), all sourced from PNW breweries and wineries. Stop by our stores to check out our selection, or come in for happy hour (mon-fri 3-6p) and enjoy our micro-brews on tap. We have Brewers Night starting in June. Or, try our selection of wine to bring out your inner connoisseur, with two wines on tap at Kent. Enjoy our offerings of organic, locally sourced foods, with PNW style eats and options for on the go. Options include eats from Molly's and Alki Bakery. We offer paninis, fresh salads, sandwiches, small plates and gourmet desserts. Additionally, we have seasonal offerings to compliment your espresso, beer or wine. Stop by at our Puyallup drive-thru stand for on-the-go needs. Visit our flagship location and enjoy espresso, drinks, food, small plates, micro-brew and wine. It is our newest location, open since 2013. It is our main event venue with Corks & Canvas painting parties, open mic every Friday and live music every Saturday. It is a great spot for community gatherings and an office away from home. We are not always rooted to the ground! Discover Urban Timber's mobile coffee trailer at local community events, fairs & festivals. Visit our events calendar or subscribe to our official Facebook page to stay in the know. Follow our mobile coffee spot to your favorite event for delicious handcrafted espresso drinks, smoothies & italian sodas as well as snacks to satisfy you for any occasion.